Today, I am excited to kickoff a five part traditional anniversary gift mini-series leading up to our 5 year anniversary at the end of this week! Since our first year of marriage we have always chosen to get a traditional anniversary gift as a couple rather than each getting separate random gifts. If you haven’t heard of these anniversary gift ideas, here are the gift ideas for the first five years: paper, cotton, leather, fruit, and wood. 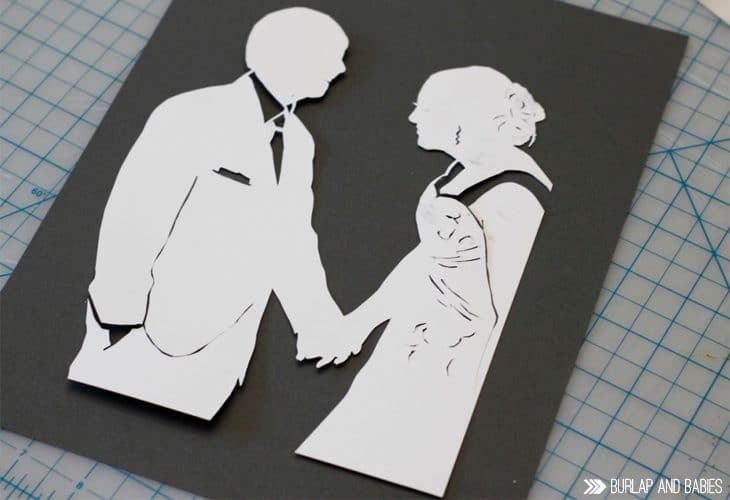 I am excited to show you how to create this DIY wedding photo silhouette that would be the perfect first anniversary gift for your loved one made from paper! We recently realized that my love language is gifts. Hence, why I hate gifts. Gifts have to be special and meaningful whether I am giving or receiving. Most of the time I just wish gifts just went away and weren’t a thing. But because that isn’t the case, I love the idea of taking one holiday off the stress less and simplifying things. We spent our first anniversary in Disneyland and decided to get our silhouettes cut out at the old-fashioned booth. 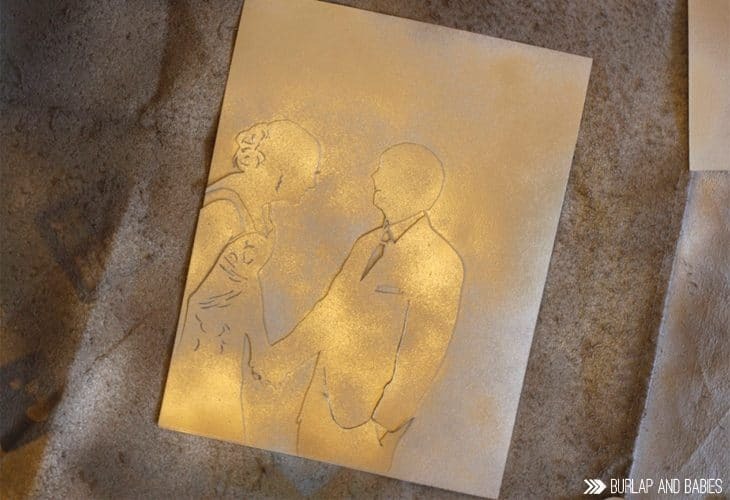 I love the look of them, however, thought it would be great to have a silhouette of us as a couple rather than just individuals. 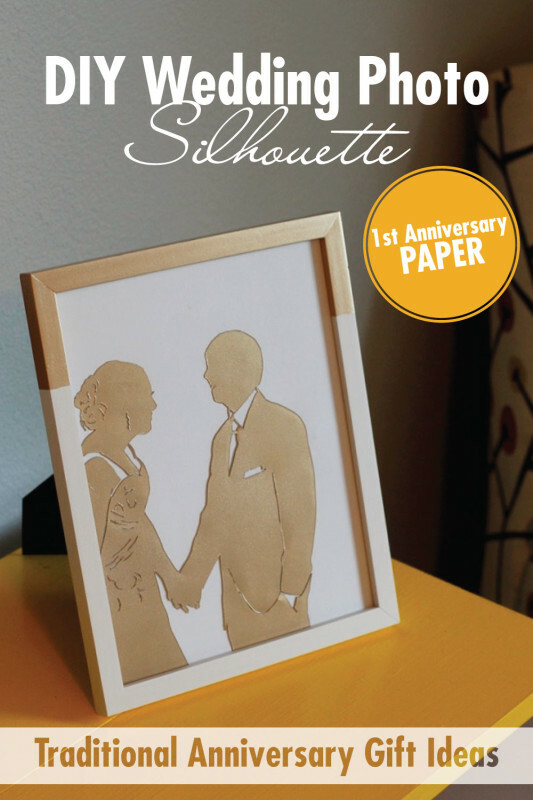 So, I DIY-ed my own and this super simple project makes the perfect paper anniversary gift for your first anniversary. 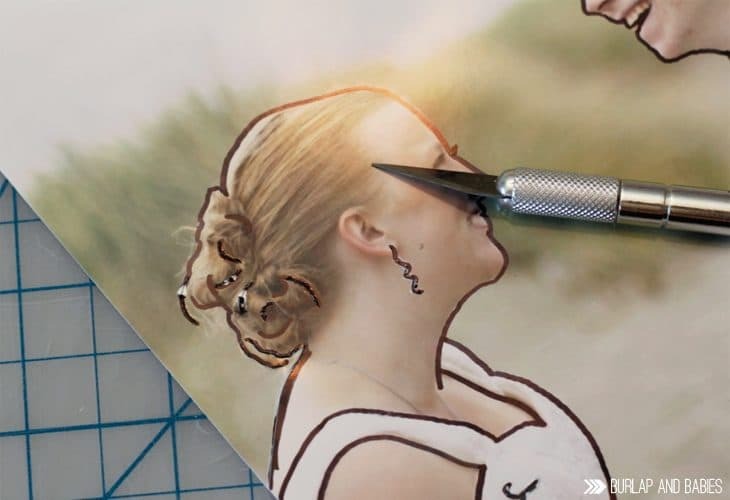 All you need is your favorite wedding picture, a sharpie, and an exacto knife. 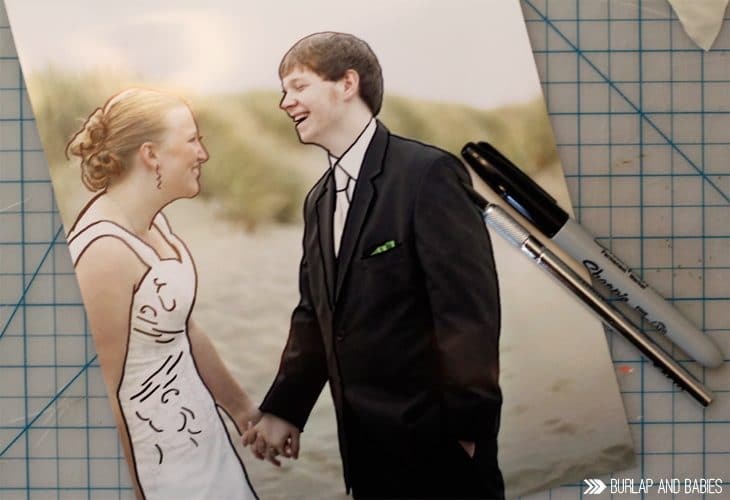 Start by ordering an 8×10 of your favorite wedding picture, or whatever size you want. Choose one that has some details included so you have some cut outs to play with. Trace the outline of your bodies and details with a sharpie. Next, take your exacto knife and start by cutting out pieces of the photo. It usually makes sense to either cut out the skin or clothes so start there as a jumping off point. You can see in the bun of my hair how you can just make up basic shapes and curves to add design. Also, don’t get too detailed when it comes to the facial features. They might end up looking like your husband has rabbit teeth and you have to trim them down. Or maybe that’s just me…. 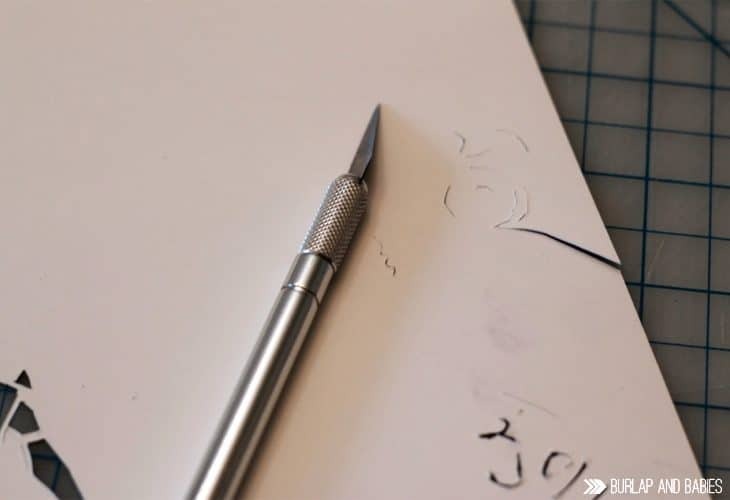 If you are cutting curved details, like in a dress or hair, cut one slice on the front side and then flip the photo over to the white back so the you can cut out a wider piece. I found it was easier to see what I was cutting by doing it that way. Here’s what it looked like before painting! You can definitely leave it like this, tape it to black paper and sticke it in a frame, or you can do what I did and paint the photo and adhere it to white cardstock. 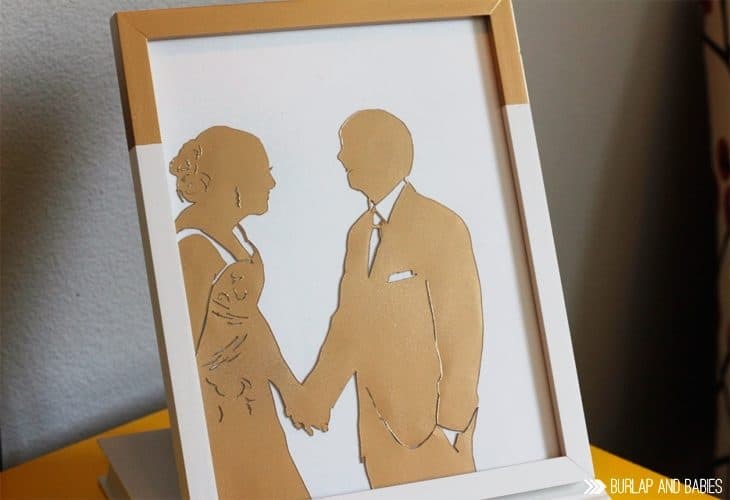 I love how this wedding picture silhouette turned out! My friend, Nakalan McKay, did such a great job with our wedding photos at the beach and I’m so glad I get to have this laughing face wake me up everyday. I also love how simple this is to make as a first anniversary gift idea. Wow! That’s beautiful! What a great anniversary gift idea. We had everyone in our family do the love language quiz. It is a really great thing to do with your kids! Gifts was last on my list. Acts of service was #1 for me. It was spot on. I am not big on receiving gifts ( unless, yes, they have a lot of thought and emotion behind them). Actions of others speaks volumes to me. Thank you for sharing this meaningful gift idea! Love this. We’re past our paper anniversary, but this will make a great gift for any special occasion! Pinning for later. This is something I’ve always wanted to do, especially for my kids! I can finally do it now, it’s never too late….we celebrated out 41st anniversary in July of this year (2015). Thank you so much for showing me how to do it. I absolutely love this idea! This would make such a great gift, and this technique is so versatile and could be used on just about any occasion and picture. Thank you so much for sharing this wonderful idea!